It appears that a whole lot of people received Fitbit tracking devices for Christmas this year. The wearable maker shot to the top of Apple’s free app chart in the United States as of the afternoon of Dec. 25. While downloads don’t give a clear picture of Fitbit’s sales, the surge suggests that many people are setting up new devices. 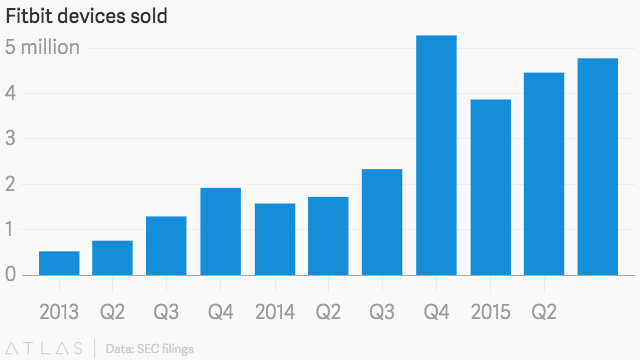 The fourth quarter has historically been Fitbit’s biggest in terms of sales. It sold 5.28 million trackers in the fourth quarter last year, more than the first three quarters of 2014 combined. During last year’s holiday season, Fitbit saw a nearly 250% rise in revenue over 2013’s fourth quarter. Fitbit’s free iOS app rankings from Dec. 25, 2014 to Dec. 24, 2015. The swell in Fitbit’s popularity today is a bright spot in an otherwise dour quarter for the company. Though it reported a strong third quarter, its stock has lost almost all its gains as the year comes to the close, hurt largely by a recent secondary offering.